The Ancient Egyptian section is one of the most popular parts of the British Museum. This is one of the largest collections in the world outside of Egypt. The explanations are very clear, outlining the manufacturing process of mummies, the embalming of the dead, burial, beliefs associated with death, the afterlife, and the various Egyptian gods. After the French were defeated and driven out of Egypt, the British army confiscated many of these objects which Napoleon had collected. This included the Rosetta Stone, one of the most important exhibits in the museum, a transcript of an Egyptian text in Greek and Latin that subsequently allowed scholars to understand and decipher hieroglyphics for the first time. 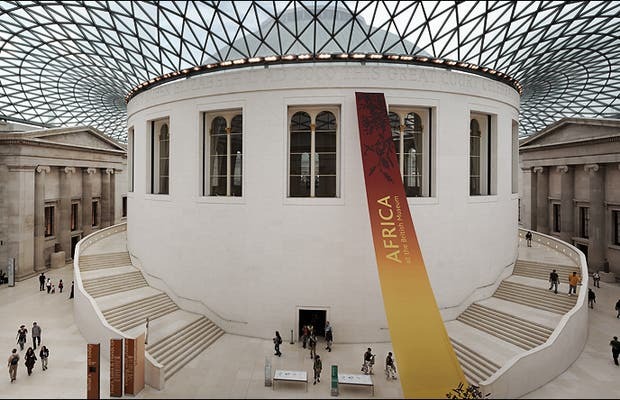 Founded in 1753, it is the oldest museums in the world. Very large, it contains much material so if you want to see everything (it takes about 6 hours). It is the most popular attraction in London, with 5 million visitors a year. It contains treasures from around the world, many of them provided by explorers and travelers of the eighteenth and nineteenth centuries. Inside is a large part of the Parthenon in Greece, as well as numerous mummies or moai of Easter Island ....;there was great controversy over the rightful place of these works, should they remain here to ensure their protection? At Information, you will be offered a plan to organise your visit which is also viewable on the website. Step back in time to ancient Egypt and get lost. Spent the whole time exploring, beautifully laid out. I would have spent more time in the museum had there been more time in the gorgeous city. It's a very beautiful and big museum! I was living one street behind BM. It was amazing to see world from the past.